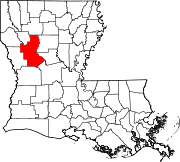 Natchitoches Parish (French: Paroisse des Natchitoches ou Les Natchitoches) is a parish located in the U.S. state of Louisiana. As of the 2010 census, the population was 39,566. The parish seat is Natchitoches. The parish was formed in 1805. Hidden by trees, the Magnolia Plantation is located in the Cane River Creole National Historical Park. Creston Baptist Church is located at the intersections of the highways leading to Ashland, Goldonna, and Readhimer. ↑ "State & County QuickFacts". United States Census Bureau. Archived from the original on July 15, 2011. Retrieved August 10, 2013. ↑ "Natchitoches Parish". Center for Regional Heritage Research. Retrieved September 6, 2014.